Won for Best Score; Best Song-"Beauty and the Beast." Nominated for Best Picture; Best Sound; Best Song-"Be Our Guest"; Best Song-"Belle." One could claim that 1991’s Beauty and the Beast offers Disney’s greatest achievement. That opinion wouldn’t relate to the film’s financial success. While Beast earned a more-than-respectable $145 million, that didn’t compare with the megabucks raked in by subsequent hits like 1992’s Aladdin and 1994’s Lion King. Also, while Beast certainly stands as one of the studio’s stronger animated movies, it doesn’t quite approach the heights of their best material. However, Beast enjoys one claim to fame that no other Disney flick can make: it represents the first animated film to earn a nomination for Oscar’s Best Picture. It didn’t win - The Silence of the Lambs nailed the prize – but this achievement still merits a lot of respect. Beast sparked the renewed interest in animation that eventually led to the creation of a new Oscar category in 2001; now we find a “Best Animated Feature” slot. Beast continues to shine as a Disney classic. It also stands as the film that brought me back into the Disny animation fold. I enjoyed their works as a kid, even though that meant I endured dreck like 1977’s Rescuers and 1973’s Robin Hood. I essentially missed the studio’s mid-Eighties part of this malaise due to my age; not a lot of teen boys dig those kinds of cartoons. By the time that Beast arrived in 1991, I was 24 and more open to this sort of material, a fact aided by the movie’s grand reception from critics. I really liked Beast when I saw it theatrically, and it helped ignite a slow-burning interest in Disney animation within me. I wouldn’t become fascinated by the studio’s full roster of films until the end of the Nineties, but without the positive adult reception accorded Beast, this may never have occurred at all. In retrospect, I’m not totally sure where Beast falls within the Disney pantheon. I used to feel it belonged among their absolute best, but I must admit my ardor has cooled somewhat over time. Nonetheless, the movie remains a very strong piece of work. Beast starts with a prologue that tells us how a handsome but arrogant young prince gets physically mutated into a beast. An enchantress gives him a specific period of time in which he must find true love, an idea that seems far-fetched given his furry appearance. As part of the deal, all of the prince’s servants got turned into household objects, and the group appears destined to live out their lives in unusual forms. The film then moves ahead a few years and lands us in a small French village. There we meet Belle (Paige O’Hara), an intelligent, lively and beautiful young woman who feels constricted by the narrow minds in her provincial town. Town hunk Gaston (Richard White) sets his romantic sights on Belle, largely because none of the other women seem quire as lovely as she. However, Belle feels no interest whatsoever in the crude, crass, and self-absorbed lunkhead. On the way to an inventor’s fair, Belle’s father Maurice (Rex Everhart) gets lost and then attacked by wolves. Out of desperation, he ends up at a gloomy castle, where the Beast (Robby Benson) holds him captive. Maurice’s horse Phillippe manages to gallop back to the family home, where his presence alerts Belle that a problem occurred. The pair set out to find Maurice, and when they do, she strikes a deal with the Beast: the spare her father, she trades places with him. The castle’s staff – as highlighted by Cogsworth (David Ogden Stiers), Lumiere (Jerry Orbach), and Mrs. Potts (Angela Lansbury) – all hope that she will be their master’s true love. This will turn them human again, but they need to coach him through a rough start to set the pair on the path to romance. Nothing about the story of Beast seems revolutionary, though the film shows some growth above and beyond the stereotypical Disney realm. For one, the independent-minded Belle represents a massive leap beyond man-crazy babes like Cinderella, Snow White, and Ariel. Belle displays an interest in meeting a beau, but she doesn’t display great eagerness toward the subject, and she seems to hold out little hope that she’ll find someone who matches her intellectual curiosity; her rinky-dink little town lets her down in that domain. Belle also shows a lack of dependence on others that seems positive. Yeah, she gets rescued during the film, but she mostly appears proactive and in control of her own destiny. After all, she chooses to become the Beast’s captive, and while he saves her from the wolves, she comes to his aid as well. She clearly doesn’t seem as helpless as many Disney heroines, and unlike most, she actually displays a really personality. With the film’s two male leads, we find a reversal of the normal order. The ugly Beast represents the positive role model – though it takes him a while to get there – while the studly Gaston offers a buffoon at best and a psychopathic menace at worst. At times, this contrast seems a little too forced for my liking. It doesn’t always come across as a natural choice, for I occasionally feel like the filmmakers tried really hard to be different just for the sake of being different. Still, it works for the film, and the two reversed evolutions develop fairly naturally. Really, I find little about which to complain in regard to Beast. The story starts a little slowly, but it soon gathers steam and becomes quite engrossing, and it packs a much stronger emotional punch than the average Disney flick. The movie’s almost-tragic climax really pulls the old heartstrings, and this makes its ultimate payoff all the more satisfying. Despite some small issues, I still really like Beauty and the Beast. While it may not be in my all-time Disney top five, it still lands high on my list, and it offers a charming and well-executed effort across the board. Beast put Disney back on the map, and it deserved much of the acclaim it received. 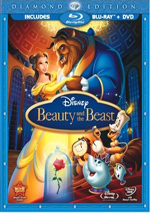 Beauty and the Beast appears in an aspect ratio of approximately 1.85:1 on this Blu-ray Disc. Virtually no problems emerged during this excellent presentation. Sharpness appeared immaculate. The movie always came across as crisp and well defined, as I noticed no signs of softness at any point. Never did the detail waver during this accurate and distinct image. Jagged edges and moiré effects created no concerns, and I detected no signs of edge enhancement. Print flaws seemed totally absent. At no point did I discern any specks, grit, marks, or other issues during this clean and fresh presentation. Beast employed a varied and vivid palette, and the tones seemed terrific from start to finish. The colors always appeared vibrant and lush, and they displayed excellent clarity without any bleeding, noise, or other issues. Black levels also were wonderfully rich and dense, while shadow detail presented clear low-light sequences that lacked any excessive opacity. Overall, Beauty and the Beast looked terrific. The moderately subdued DTS-HD MA 7.1 soundtrack of Beauty and the Beast didn’t quite compare with the visuals, but it worked well for the material nonetheless. The track usually featured a forward emphasis, though this broadened during logical sequences. Music showed excellent stereo delineation, and quite a few isolated elements appeared in the side channels during production numbers. Effects also created a nice sense of atmosphere, and bits such as carts or other moving pieces panned smoothly from one side to the other. Overall, the various elements blended together quite cleanly. As for the surrounds, they usually did little more than generally support the music and effects, but a few exceptions occurred. Most of those happened during the movie’s action climax, as the surrounds kicked into gear more compellingly. The wolf attacks also brought noticeable dimensionality from the rear speakers, and we even got some decent and accurate split-surround material at times. Nonetheless, this mix remained oriented toward the front, which seemed appropriate for this sort of film. Audio quality appeared solid. Speech came across as distinct and natural, and I noticed no signs of edginess or problems related to intelligibility. Effects sounded clean and accurate for the most part. They never displayed any signs of distortion, and they boasted positive dynamics. Music sounded bright and clear, and the songs offered fine range and delineation. Ultimately, Beauty and the Beast won’t be your demo soundtrack, but it worked just fine for this film. How did the picture and audio of the Blu-ray compare to those of the 2002 DVD? The audio was a bit tighter and more dynamic, and the visuals showed a substantial step up in quality. Despite some artifacts, the DVD looked very good, but the Blu-ray was significantly more accurate and concise. This was a nice upgrade. The Blu-ray includes most of the DVD’s extras along with some new ones. I’ll mark Blu-ray exclusives with exciting blue print. Disc One provides three – that’s right, three! – different versions of the film itself. In addition to the original 84-minute theatrical release, we get the 2002 “Special Edition” cut that includes the number “Human Again” as well as the 84-minute “Work-In-Progress” version. To generate some buzz for the flick. Disney ran the unfinished Beast at the New York Film Festival about six weeks prior to its theatrical opening. This attempt worked, and the “WIP” became a sensation in its own right. In fact, the “WIP” appeared on laserdisc before the finished film made it onto video. Unfortunately, “WIP” fans will have to head to this set’s DVD for the most satisfying presentation of it. The Blu-ray relegates that footage to a tiny box in the upper left corner of the screen. Why? While it’s nice to compare the differences between the final film and the “WIP”, the disc gets it backwards; it’d work better if the theatrical version appeared in a little box and the “WIP” filled the screen. I find it befuddling that Disney includes the “WIP” on the Blu-ray but neuters it this way. As for the SE, it differs from the older two mainly due to “Human Again”, though some of the art after that song alters the material seen in the original; the servants clean the house during “Human Again”, which meant the animators needed to tidy up things from the decrepit state seen in the original movie. Does this make it any better? Not really. The original remains very good and is probably the best version. Next we find an audio commentary from directors Kirk Wise and Gary Trousdale, producer Don Hahn, and composer Alan Menken. The first three sit together for a running, screen-specific track, but Menken’s remarks seem to come from a separate session. Wise, Trousdale and Hahn cover many aspects of the production. From casting to story changes to animation challenges, you’ll learn tons of details about Beast, and due to their light and engaging style, you’ll have a lot of fun along the way. As for Menken’s contributions, he adds some useful details. He covers the creation of some songs and also provides cool notes like the direction that late co-composer Howard Ashman gave to Paige O’Hara for her “There’s Something There” vocals. Although I enjoyed Menken’s remarks, I still don’t understand why the disc’s producers tried so hard to create the illusion that he sat with the other three. Maybe I’m wrong and he really did tape his comments alongside that trio, but I strongly doubt it. Why bother to try to fool us? It seems odd and pointless, but this remains a terrific commentary. Beast provides something called a Sing-Along Track. This provides subtitles for all the movie’s songs. With this feature activated, they pop up when any of the tunes appears. It does nothing for me, but it seems like a fun extra. For something new, we head to the 20-minute, 18-second Composing a Classic. It provides a chat among Hahn, Menken and agent Richard Kraft. They discuss aspects of the songs and Menken’s collaboration with an ailing Howard Ashman. Some of this material repeats from the commentary, but the featurette still offers a nice overview of the subject matter. Two Deleted Scenes come next. We find “Alternate Story Open” (18:24) and “Belle in the Library” (8:27). Each clip also provides its own intro; “Open” features former Walt Disney Company chairman Peter Schneider (0:32), while “Library” uses story supervisor Roger Allers (0:36). “Open” offers a radically different start to the film. It includes some basic similarities with the final film – such as Gaston’s desire to marry Belle – but it usually bears almost no resemblance to the released product. That helps make the story reel presentation especially interesting. As for “Library”, it includes four characters who didn’t make the final film. As expected, all of them are inhabitants of the castle’s library. I can understand why it got cut – it’s long and adds little – but it’s still fun to see these “lost characters”. For a look at the stage show, we head to Broadway Beginnings. 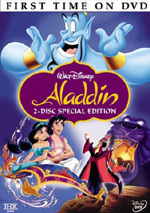 It goes for 13 minutes, seven seconds, and includes statements from Menken, Disney Theatrical Group Vice President of Creative Development and Licensing Steven Fickinger, book writer Linda Woolverton, former cast members Jamie-Lynn Sigler, Nick Jones, Ashley Brown, Christy Carlson Romano, Donny Osmond, Deborah Gibson, and Andrea McArdle. The actors discuss their initial reactions to Broadway shows, and we also get notes about the adaptation of Beast and other aspects of the production. It occasionally feels a bit more like advertising than I’d like, but the presence of the stars helps make it interesting. What would a Disney release be without a modern update on an old song? A welcome relief, but this one doesn’t buck the trend, as it includes a music video from Jordin Sparks. She updates the title song with a tepid cover. The video itself provides the usual boring mix of lip-synch shots and movie clips. Blah! Disc One also includes the usual complement of ads at the start of the disc. When you pop the platter in your player, you’ll find promos for Tangled, Toy Story 3, and Bambi. These also appear under Sneak Peeks along with clips for The Lion King, A Christmas Carol, Fantasia/Fantasia 2000, Dumbo and Alice in Wonderland. With that, we head to Disc Two. The prime attraction here comes from Beyond Beauty: The Untold Stories Behind the Making of Beauty and the Beast. 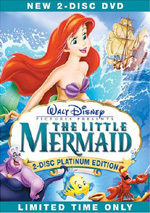 It runs 53 minutes, 15 seconds and offers notes from Hahn, Schneider, Allers, Menken, Trousdale, Wise, animation critic/historian Charles Solomon, former Disney chairman Jeffrey Katzenberg, supervising animators Mark Henn, James Baxter, Will Finn, Dave Pruiksma, Andreas Deja, Glen Keane and Nik Ranieri, screenwriter Linda Woolverton, art director Brian McEntee, and actors Angela Lansbury, Robby Benson, and Paige O’Hara. “Stories” looks at the status of Disney animation in the 1980s and the department’s revival, research, developing Beast and story/character areas, music, cast and performances, animation, promotion and the film’s reception, and its legacy. “Stories” creates a pretty good overview of the production. At times it feels surprisingly superficial given its length, but it still manages to throw in plenty of interesting details, and it even indulges in some conflicts, so it’s not just a happy-happy take on the flick. It’s an enjoyable, satisfying piece. Along the way, “Beyond” offers some branching options. Some of these include additional featurettes. We find Disney: A Fairy Tale (8:04), Full Circle to Broadway (9:56), Ever a Surprise: A Portrait of Howard Ashman (13:25), and Frame By Frame: A Thumbnail Sketch of the History of Animation (13:56). Across these, we hear from Hahn, Deja, Pruiksma, Menken, Finn, Baxter, Schneider, Lansbury, O’Hara, Katzenberg, Solomon, Disney historians Paula Sigman, Brian Sibley, Didier Ghez and Christopher Finch, Disney historian/artist Stacia Martin, Walt Disney Studios story artist Floyd Norman, animation historian Jerry Beck, theater critic/historian Patrick Pacheco, Howard Ashman’s sister Sarah Gillespie, Ashman’s partner William Lauch, actor Jodi Benson, and USC Professor of Animation Christine Panuschka. “Tale” looks at the history with fairy tales and Disney’s use of them, while “Circle” looks at topics connected to Disney musicals. “Ashman” discusses the life and career of the late composer, and “Sketch” indeed provides a quick examination of the history of animation. All provide good information, though “Sketch” proves to be the most satisfying. Sure, animation fans will already know the material, but it’s such a tight synopsis that it’s fun to see. Some early Disney material shows up within Laugh-O-Gram Fairy Tales. This area includes four shorts: “Puss in Boots” (10:56), “Little Red Riding Hood” (6:18), “Cinderella” (7:23) and “The Four Musicians of Bremen” (8:27). To be honest, they’re pretty lousy little silent cartoons, but they possess undeniable historical value, so I welcome them. Animation and Production Galleries break into two domains. “Image Galleries” cover “Storyboard Art” (73 elements) and “Character Design” (89). “Video Galleries” splits into “Character Development” and “Cartoons”. These provide video clips to discuss various topics. “Character Development” goes over “The Beast” (3:48), “Cogsworth” (2:51), “Lumiere” (2:48), “Gaston” (3:11), “Mrs. Potts” (2:13), “New Digital Horizons” (4:20), “Will Vs. Nik” (3:13) and “Acting as a Team: Bringing Belle and the Beast to Life” (6:43). Across these, we hear from Keane, Finn, Ranieri, Deja, Pruiksma, McEntee, Ghez, Martin, Panuschka, Baxter, Trousdale, Wise, O’Hara, Henn, Benson, Pocahontas art director Michael Giaimo, Disney Imagineering VP Tony Baxter, background supervisor Lisa Keene, layout supervisor Ed Ghertner, and animator Tom Sito. These pieces look at character design, animation and performances. They’re consistently informative and enjoyable. “Cartoons” throws in three bits that influenced Beast: “Silly Symphony – China Shop” (8:54), “Silly Symphony – Music Land” (10:23) and the “Doorknob Clip” from Alice in Wonderland (2:12). All are nice to see. Backgrounds and Concepts includes more stillframe materials. “Visual Development” provides 58 shots of concept art, while “Backgrounds” offers 30 pieces created to be used in the film. Both continue to give us useful elements. That ends the components under “Beyond Beauty” and we head elsewhere. 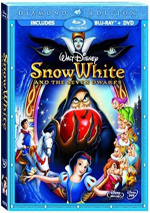 The Story Behind the Story resembles the “Disney Through the Decades” feature found on 2001’s Snow White DVD. In this 25-minute and 36-second program, a series of celebrity hosts lead us through discussions of seven different Disney flicks: Cinderella, The Lion King, Pocahontas, The Jungle Book, Sleeping Beauty, Mulan, and The Hunchback of Notre Dame. We hear from Celine Dion, Paige O’Hara, James Earl Jones, David Ogden Stiers, Robby Benson, Jodi Benson, Ming-Na, and Angela Lansbury. These discussions mostly feature tellings of the different stories. The narrators then relate some details about the creation of each movie. Since these segments go by very quickly, we get little depth, and most of the material will seem familiar to Disney fans. Still, it’s a reasonably brisk and entertaining look at some Disney history, so it merits a look. After this, we get the music video for the pop version of “Beauty and the Beast” performed by Celine Dion and Peabo Bryson. It starts with a modern 25-second introduction from Dion and then launches into the four-minute clip. As with most videos for songs from movies, it simply combines some lip-synched performing with scenes from the film. It’s a syrupy rendition and a dull video. Next comes an Early Presentation Reel. After a 38-second introduction from Don Hahn, we get the two-minute, 14-second combination of music and rough art. The product doesn’t bear much resemblance to the final film, which makes it interesting to watch. A few unused tidbits appear.. First up is an Alternate Version of “Be Our Guest”. Hahn provides a 73-second introduction before we see the three-minute, 42-second piece. A mix of pencil animation and storyboards, the house staff performs for Maurice instead of Belle, which creates the main difference. This means some different gags as well – they treat Maurice more comically than Belle, who also wouldn’t be allowed to drink beer – but much of the piece stays the same. Nonetheless, it’s very cool to check out the original conception of the number. Alternate Score: The Transformation starts with a 25-second introduction from composer Alan Menken. After that we see the film’s climactic change shown with rough pencil animation and different music. The 98-second clip doesn’t seem tremendously different, but it’s still good to get. Next we get the six-minute and 57-second Deleted Song “Human Again”. This alters the version seen in the SE. Instead, it offers a very early storyreel rendition of the number. It combines filmed storyboards with temp voices and a basic take of the song. Some of its elements show up in the SE’s versoin of the song, but others appeared elsewhere in the theatrical cut. It’s another cool glimpse of the film’s early concepts. Note that two intros come here: one from Hahn (0:46) and Menken (0:42). A few tidbits show up under “Animation”. Animation Tests, Roughs and Clean Ups runs four minutes, 55 seconds. Hahn narrates the piece, which shows early incarnations of some material. It’s fun to see the material, but Hahn’s insight makes the short piece especially useful. The Transformation: Pencil Version starts with a 65-second introduction from Hahn. We then see the early rendition of the film’s climactic sequence. The four-minute and 20-second piece seems quite rough, but it offers a very compelling look at the basic product prior to much clean-up work. In A Transformation: Glen Keane, we get a 194-second chat with the animator of the Beast. He discusses his work on the film’s climactic segment and gives us some useful notes about the topic. The Camera Move Test begins with a 41-second introduction from Hahn before we see 86 seconds of the computer camera test for the ballroom scene. It’s another good look at the animation process. Trailers & TV Spots begins with the requisite 34-second introduction from Hahn. We then find two trailers. One came from the film’s original 1991 release, while the other accompanied the 2002 “large format” release. In addition, we get four TV ads, all of which appeared back in the early Nineties. Under “Family Play”, we get a few options. Enchanted Musical Challenge requires you to hunt for various characters to help make the castle’s inhabitants “human again”. It requires you to answer trivia questions and search rooms. Like most games of this sort, it’s not much fun; it’s more tedious and frustrating than anything else. Another game follows. Bon Jour, Who Is This? is called a “TelePlay Game”, whatever that means. I do know it requires BD Live to play, which leaves me out. Too bad for me! Lastly, a separate disc provides a DVD Version of the film. This is nice if you want to take the movie on the go – or if you want the best rendition of the “Work in Progress” version of the film. Beauty and the Beast remains one of Disney’s best. I probably prefer the original theatrical version to the altered “Special Edition”, but since this set includes both, I won’t complain. The Blu-ray provides excellent visuals, very good audio, and an extensive roster of supplements. It’s a solid upgrade over the DVD and worth inclusion in the collection of any Disney fan.